Below we present a rosacea treatment clinical study which demonstrates the superiority of natural Bioflavanoids compared to other popular rosacea prescription medications in the treatment of rosacea . In turn, these findings corroborate other clinical studies that validate the effectiveness of natural treatment options for rosacea using peer-reviewed, human clinical studies. This study also demonstrates the effectiveness of Rosadyn™ by extension, as each of Rosadyn’s ingredients were chosen on the basis of their performance in similar clinical evaluations as the one presented here. This article is divided into two segments: a short summary of the study for those interested in just a high level overview and a more in-depth explanation for those desiring more granular detail. Rosacea is a disorder of the facial blood vessels. Rosacea blood vessels are genetically predisposed to structural damage, fragility, inflammation, leakiness and widespread overgrowth – the tell tail symptoms of rosacea, facial redness, broken blood vessels, swelling, burning and more. Rosacea Treatment Comparison: The clinical study compares a bioflavanoid-based oral nutraceutical comprised of a proprietary blend of three bioflavanoid extracts with strong vascular-specific actions that work synergistically on reversing diseased blood vessels when used simultaneously in an oral delivery nutraceutical vs. traditional prescription based medications. What is an Bioflavanoid? Bioflavanoids are extracts found in fruits, vegetables and various herbs that have strong anti-oxidant, anti-inflammatory, and, in some cases, potent vascular strengthening and blood vessel repair activity. After the clinical study was completed the patients discontinued treatment for 12 months to see if the vascular symptoms and triggers would return. the prescription-treated group of rosacea sufferers continued to worsen. Verifying that these specific bioflavonoids had long-acting, positive effects on diseased blood vessels caused by rosacea. To the best of our knowledge, there are no oral or topical prescription medications that fix or cure rosacea-induced physical and functional defects at this time – But, the good news is that rosacea sufferers can control, minimize and halt the progression of rosacea symptoms and disorder. Over the last three decades pharmaceutical companies have developed dozens of topical and oral prescription treatments for rosacea. The main drawback to these treatments is that they only target superficial symptoms such as rosacea papules, pustules and inflamed facial skin. They do not treat or reverse the underlying cause(s) of the disorder and rosacea sufferers still have to avoid all their rosacea triggers while undergoing treatment. While there are numerous hypotheses to the cause(s) of rosacea, most dermatological experts agree that the primary instigating cause centers around blood vessel pathophysiology in the dermal skin and this is confirmed by histological and Doppler-flow studies [1-4]. Blood vessels and lymphatic vessels (vessels that carry inflammatory proteins, immune cells and excess skin fluid back to the lymph nodes via clear lymph fluid) are genetically prone to physical damage, vascular wall inflammation, abnormal hyper-reactivity, fragility and uncontrolled blood vessel overgrowth (angiogenesis) — ultimately lead to inflammatory papules, pustules, fibrosis, swelling, facial redness (erythema), broken blood vessels (telangiectasia), flushing, blushing, skin inflammation and rosacea triggers [5-8]. To date, no oral or topical pharmaceutical treatment has been developed to treat rosacea-induced vascular pathophysiology . Treatments do not repair physical abnormalities, normalize vascular hyper-responsiveness, strengthen blood vessel walls or stop uncontrolled angiogenesis. Recently, one topical lotion has been developed to constrict superficial blood vessels in an attempt to reduce erythema and telangiectasia, but this treatment only lasts 6 to 8 hours and multiple peer-reviewed dermatologic studies have already been published warning of the potential side effects of this new treatment which can include rebound dilation, spontaneous flushing, chronic erythema, and persistent burning and stinging sensations. This is the best approach to treat rosacea symptoms and triggers because not only does it address the primary genetic defects in rosacea blood vessels, but it creates healthy new dermal skin, prevents future free radical damage and treats every layer of facial skin because it is delivered orally — as it enters the skin through the vascular system it treats the lower dermis, mid-dermis, upper dermis and even the outer protective epidermal layer of skin. The 15 patients on the bioflavanoid treatment all presented with significant reductions in erythema and telangiectasia at the three-month evaluation mark. They then stopped treatment with the bioflavanoid-nutraceutical. All 30 patients returned 12 months later for re-analysis of symptoms. The 15 control patients who did not take bioflavanoid-nutraceutical presented with increased erythema and telangiectasia – their rosacea continued to worsen. The 15 patients who took bioflavanoid presented with significant clearance of facial erythema and modest, but significant, reductions in telangiectasia comparable to the three-month mark clearance values. 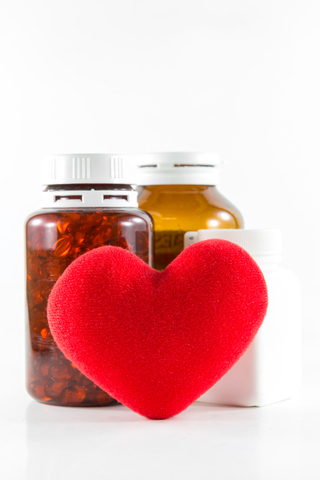 This demonstrated that the non-prescription, bioflavanoid-nutraceutical reversed much of the vascular damage and dysfunction and the clearance continued for at least 12 months after stopping bioflavanoid treatment. 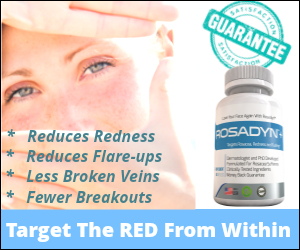 Rosadyn is a non-prescription oral nutraceutical that contains the same exact proprietary — three-bioflavanoid blend — used in the clinical study plus it also contains four additional potent bioflavanoids at clinical doses and has an excellent 5½ year track record in the rosacea community. What are the Main Active Ingredients in Rosadyn™ and How Do They Function? Rutin – a natural bioflavanoid found in high concentrations in apples and various teas. Rutoside is the main active ingredient in Rutin that is responsible for strengthening blood vessels and reducing vascular wall inflammation. Hesperidin – a natural bioflavanoid primarily found in orange peels. This is one of the best bioflavonoids for overall vascular health and protection. Eastern White Pine Bark Extract (Standardized to 95% Proanthocyanidin content) – this form of specialized pine bark contains several of the strongest bioflavonoids studied to date including oligomeric proanthocyandins, catechins and phenolic fruit acids. Based on the number of active ingredients, their concentrations and unique actions, Rosadyn is a superior product to the bioflavanoid-nutraceutical studied in the clinical trial for rosacea treatment. While the clinical study only treated rosacea sufferers for three months and this resulted in long-term clearance, one must remember that rosacea is a progressive disorder with no current cure. Longer treatment could have resulted in better resolution of erythema and telangiectasia. We also know that it takes at least three skin cycles (each cycle is approximately 30 days) to stop the rosacea-induced inflammation and several more cycles to fix the damage and clear the inflammation. That is why Vascular Health Specialists recommends at least six months of treatment with Rosadyn and varying treatment doses depending on the stage of rosacea and the individual’s response to treatment during the first one-to-two months. This treatment protocol has worked on hundreds of hard-to-treat rosacea clients over 5½ years. No Risk Guarantee: We offer a full six-month money back guarantee to anyone not satisfied with their results – a six month guarantee is unheard of in the supplement/nutraceutical world, but we believe in our product and have seen its efficacy over the years. After six months of treatment, most rosacea sufferers can slowly reduce their dose to a low maintenance dose to ensure that clearance is maintained. Wilkin, J.K. Rosacea. Pathophysiology and treatment. Arch Dermatol 130: 359-362, 1994. Sobottka, A. Rosacea 2009: New Advances in Pathophysiology, Clinical Staging and Therapeutic Strategies. Hautarzt: 60(12):999-1009, 2009. Yamaski, R. The molecular pathology of rosacea. J. Dermatol. Sci: Aug;55(2):77-81. 2009. McAleer, MA, Powell, FC. The pathophysiology of rosacea. Dermatol Venereol: 144(6):663-71. 2009. Marks, R. and J.N. Harcourt-Webster. Histopathology of rosacea. Arch Dermatol 100: 683-691, 1969. Neumann, E. and A. Frithz. Capillaropathy and capillaroneogenesis in the pathogenesis of rosacea. Int J Dermatol 37: 263-266, 1998. Nunzi, E., A. Rebora, F. Hamerlinck, and R.H. Cormane. Immunopathological studies on rosacea. Br J Dermatol 103: 543-551, 1980. Wilkin, J.K. “The red face: Flushing disorders”. Clin Dermatol 11: 211-223, 1993.